Healthcare is the world’s most information intensive industry. Every day this industry produces massive volumes of data that, if properly used, can improve clinical practice and outcomes, guide planning and resource allocation, and enhance accountability. Electronic health information is fundamental to better health care. There will be no quantum leap forward in health care quality and efficiency without high quality, user-friendly health information compiled and delivered electronically. That said, Canada’s Healthcare Informatics arena is rapidly changing, primarily due to growing public and private investment in Electronic Health Information Systems (EHIS). At the same time, a recent economic study (November 2009) identifies a serious need for increased labor and skills amongst Canadian Health Information (HI) and Health Information Management (HIM) professionals over the next five years. To compound further, there are fears in both the private and public sector that the successful implementation of EHIS systems is potentially jeopardized due to lack of qualified human resources. Add to this - - issues around Canada Health Infoway Funding, a limited and flawed EHR blueprint, Federal and Provincial politics, lobbying, posturing, competition, and (yes) corruption - - and it’s easy to see how a feast or famine (all or nothing) environment has been established. 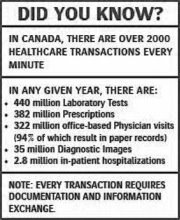 From a consumer standpoint in Canada, advancing patient care has also unfortunately been tied directly to those vendors that have the bandwidth to extend a provincial or national solution (even if those platforms are antiquated and in many cases not standardized). This discussion (and subsequent funding) is entirely based on resources, and while absolutely a relevant conversation - - in practice - - has only left Canadian’s with a sub-par platform and an increased tax-burden. So, while increasing evidence (and PR buzz) attempts to illuminate progress in extending a Canada-wide EHIS - - it’s really only proven to be lip service. As political pressures mount, huge contracts are extended to vendors who are in many cases no more equipped to deliver an integrated EHIS than a local start-up. The best example one might extend related to the state-of-the-union of Canadian EHIS is from the “Wizard of Oz”. 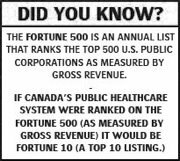 One might think that it’s only a matter of time before Canadian citizens get wise to the kick-back’s, cost over-run’s, deception, and general systemic corruption in Canadian EHIS. Let’s not even get started on the role of “Consultants” in all of this. The unfortunate challenge is that, unless one is deeply entrenched in this sector for a number of years - - most investigations are only typically scratching the surface. Neither the Canadian Government nor any of its elected bodies have yet to even get close to the real issues (and savvy multi-national vendors are well aware of this and capitalizing on it.) When Canadians finally pull back the metaphorical ‘curtain’ to see the ‘Wizard’ pulling furiously on ropes and levers - - to attempt to evidence progress - - they’re going to wonder whose hand was on the wheel? Just take a look at the long, detailed (and growing) list of Federal and Provincial resources (i.e. dollars) allocated to accomplishing specific EHIS tasks that are never completed or even accounted for. MEDSEEK recognizes HHS for its outstanding web portal vision, innovation, performance and achievement. BIRMINGHAM, Ala.--(BUSINESS WIRE)--MEDSEEK, the leading provider of enterprise portal connectivity solutions, announced today that Hamilton Health Sciences (HHS) won MEDSEEK’s 2009 eHealth Excellence Award for outstanding vision, innovation and performance in using web portal technology to enhance care delivery, information access and service. The award was presented to Dale Anderson, HHS’ manager of projects and eHealth solutions, at MEDSEEK’s 9th Annual eHealth Client Congress in Tampa, Fla., on Feb. 25, 2009. Hamilton Health Sciences is one of the most comprehensive health care systems in Canada. Its six hospitals and cancer facility are licensed for more than 900 beds and serve more than 2.3 million residents of Hamilton and central south and central west Ontario. Through its affiliation with McMaster University's Faculty of Health Sciences, HHS offers some of the most innovative treatments and talented medical professionals in Canada. Over the past 4 years, more than 2,700 HHS clinicians have registered to access its patients’ electronic medical records in real time via a portal called ClinicalConnect. Through this portal, clinicians have access to a unified, single view of a patient’s clinical reports, laboratory results, medication lists, images and other data stored in disparate clinical systems. These systems include a hospital information solution from MEDITECH, picture archiving and communication system from GE Healthcare as well as a health information management application from Sovera Document Imaging. In 2007, HHS redesigned its consumer portal to make it easier and more convenient for patients and visitors to access health information and interact with the organization. The consumer portal provides greater emphasis on patient education and included an upgrade of the existing infrastructure to make the site more stable and reliable for end users. HHS, which is the largest employer in Hamilton, has also implemented an employee portal to disseminate and streamline communication with its more than 10,000 employees, improving efficiency, productivity, job satisfaction and staff retention. Employees are using the portal to access staff directory, schedules, internal job postings, training and more, helping HHS’ human resources department operate more efficiently. “We are honored to be recognized by MEDSEEK for excellence in the use of eHealth to improve patient care, safety and operational efficiencies,” said HHS’ Anderson. “We chose to partner with MEDSEEK for its unparalleled insight into healthcare technology innovations and best practices, and its focus on the user experience which has truly transformed and streamlined our ability to provide quality patient care.” Although ClinicalConnect began at Hamilton Health Sciences, it is now being extended and adopted by the Local Health Integration Network or region to interconnect other hospitals, community healthcare agencies and healthcare providers. Hamilton Health Sciences is a family of six unique hospitals and a cancer centre, serving more than 2.3 million residents of Hamilton and central west Ontario. Hamilton Health Sciences is the second largest hospital group in Ontario and serves as a regional referral centre for burns, trauma, cardiac, stroke, neurosurgery, pediatrics, digestive diseases, high-risk obstetrics, cancer, orthopedics and rehabilitation services. With a staff of approximately 10,000, the hospital is the largest employer in Hamilton, Ontario. As an academic teaching hospital with more than 900 beds and an affiliation with McMaster University and Mohawk College, Hamilton Health Sciences is committed to providing exemplary health care for the people and communities we serve and advancing excellence in education and health research. For more information, visit www.medseek.com or call 888-MEDSEEK. It seems everybody wants in on the action. Known for its low-cost food, clothing and appliances, Wal-Mart soon will be offering reasonably priced electronic health record systems. In a story apparently leaked to the New York Times earlier this week, the big box store will join forces this spring with Dell computers and eClinicalWorks, a provider of healthcare information technology, to offer low-cost EHR systems to physicians, The New York Times reports. Systems are expected to only cost $25,000 for the first physician and $10,000 for additional physicians in a particular (non-acute care) practice. What's included? Dell is offering its laptops and tablet PCs for physicians to use. eClinicalWorks will provide its electronic health record and practice management software. eClinicalWorks is an Internet-based service that also allows physicians to manage billing and registration online. Dell will install the hardware, while eClinicalWorks will be responsible for installing its software on the PCs, as well as for training and maintenance of the system. A $19 billion healthcare information technology initiative in the recent stimulus package would provide physicians more than $40,000 over several years for implementation of EHRs, according to the Times. A former Bush administration healthcare IT official told the Times that such low-cost EHR systems from Wal-Mart could be a "game changer" in the industry's efforts to spur adoption of the technology. Long-term care is working with the rest of healthcare to contribute its portion to the development of an electronic health record system. Bush had set a goal of 2014 for the establishment of such a system. After numerous grants from the Department of Defense, the National Cancer Institute and the U.S. Department of Energy, in 2000, DIGIRAD CORPORATION notably brought the first commercial solid-state gamma camera for nuclear medicine to the market. Imagine an enterprise-wide, multi-disciplinary, integrated, vendor-neutral (web-based) imaging solution using one database. Thinking Systems seamlessly manage and store nuclear medicine, PET, echo cardiology and Cath lab images; supporting image registration and even fusion among multimodalities (i.e. PET, SPECT, CT, MR, etc.,) including image quantitative analysis (for cardiac and brain studies) and orthopedic templating. Providing truly customized implementations, Thinking Systems translates the power of its versatile product portfolio and expertise into highly effective solutions tailor-made for each installation. THINKING SYSTEMS solutions are installed worldwide in leading hospitals, research institutes, imaging centers, and doctor’s offices, including US notables like Yale, Mass General, Univ. of Miami, and Kettering Medical Center. In Canada, THINKING SYSTEMS are utilized by the Humber River Regional Hospital. Mount Sinai Hospital (MSH,) Women’s College Hospital (WCH,) Toronto Western Hospital, Toronto General Hospital, Princess Margaret Hospital (PMH,) the University Health Network (UHN,) and a number of clinic sites. ACUMEME is seeking articles, commentary and ideas on the state of electronic health records (EHR) and e-Health 2.0 in Canada. Have something to say? Here’s your sounding board. Anonymity assured. E-mail us at acumeme@yahoo.com. 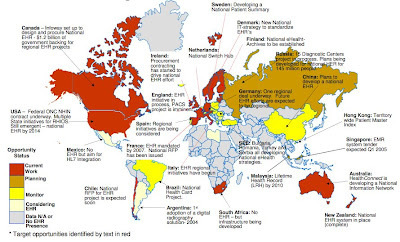 HIMSS Global Enterprise Task Force (GEFT) investigates implementation of EHR’s in 15 countries around the world. The extensive study reviewed healthcare IT progress in Europe, Asia Pacific, Middle East and North America. A 16-member task force looked at various EHR components within each country, including, security, quality, financing sources and barriers to adoption. The 119-page report presents findings on EHR implementation by country. Each chapter features an overview of the country’s electronic health record status followed by a review of achievements, barriers and recommendations in the different areas. The HIMSS Global Enterprise Task Force (GEFT), formed in 2006 under the HIMSS Enterprise Information Steering Committee, includes industry leaders from around the world who provide expert analysis from a local perspective. The work group plans to update and expand the report in future editions and calls on interested health IT experts throughout the world to contribute. Contact the HIMSS Europe office at europe@himss.org for more information on participation. PHR: Is There an Easier Way? The Chinese “Green Book” achieves some goals currently unattained in the U.S.
Perhaps this will be the year Personal Health Records (PHRs) will catch on with the public and begin realizing their potential. There is certainly no shortage of products available. Nor is there a shortage of approaches to the technology, level/type of information stored and sophistication of tools. Surveys indicate PHR's are gaining the interest of the American health care consumer and suggest that large-scale usage cannot be too far off. Nonetheless, the PHR still has the lowest adoption rate of any major EHR function in hospitals and physician offices. Are we over-complicating the concept of the PHR? After all, patients have always been the primary source of information about their personal illnesses and injuries, but now that we are starting to utilize technology, create laws, and develop policies and procedures about such information, we may actually be creating problems. Perhaps we could learn a lesson from China — where a simple, yet remarkably effective (in some ways,) version of the PHR is in widespread use. Patients visiting many of China's public hospitals for outpatient care receive a "green book" that constitutes their ambulatory patient record. During the course of a patient visit, the doctor enters clinical notes such as patient complaint, test results, diagnosis and prescribed medications. All notes are handwritten. At the conclusion of the visit, the physician gives the 'Green Book' back to the patient or other responsible party. When the patient returns for treatment or medication refill, he/she must bring the 'green book', which the physician uses to maintain continuity of care. Neither the hospital nor the physician keeps a copy of these ambulatory records; the patient receives the sole copy. Portability: So long as the patient brings their 'Green Book' to the visit, it can be shared with any provider without hassle or delay. Interoperability: Could U.S. interoperability issues really be a euphemism for "I don't want to do it?" Are we making it too hard by trying to be perfect? Patient Accountability: The responsibility for preserving, protecting and presenting the record belongs to the patient. The U.S. is not advocating that the health care system place such responsibility and accountability entirely on the patient, but maybe sharing would be beneficial? General Standards: The standards for use, format and content are high-level, achievable and appear to be well-accepted. Physician Acceptance: It appears that virtually all caregivers who are supposed to use the green book actually accept it. The temptation for individuals to replace it with something they like better appears to have been resisted. The Chinese are not drowning in worthy options. The green book PHR concept is simple, especially in comparison to American high-tech options. However, sometimes our technology becomes as much a barrier as a solution and large-scale PHR adoption will not occur in the U.S. until the outlined goals are achieved using technology as an enabler. Original Article by Michael R. Cohen, CPHIT, CPEHR, FHIMSS, and Margret Amatayakul, RHIA, CHPS, FHIMSS. The Health Care in Canada (HCIC 2008) Report provides a review of key analytic work undertaken at CIHI that highlights CIHI's health care research priorities (access, quality of care, health human resources, funding/costs, etc.). Also included in this report is a review of seminal national and international health care research as it maps onto these health care priorities. HCIC 2008 is a tool for health care researchers, persons involved in strategic decision-making in health care, the media and Canadians in general to identify current priorities in health care. DOWNLOAD HCIC 2008 REPORT (.PDF). The Canadian Institute for Health Information (CIHI) collects and analyzes information on health and health care in Canada and makes it publicly available. Canada’s federal, provincial and territorial governments created CIHI as a not-for-profit, independent organization dedicated to forging a common approach to Canadian health information. CIHI’s goal: to provide timely, accurate and comparable information. CIHI’s data and reports inform health policies, support the effective delivery of health services and raise awareness among Canadians of the factors that contribute to good health.